On Tuesday afternoon, the Eagles and rookie defensive end/linebacker Ricky Sapp agreed to terms on a four-year contract. 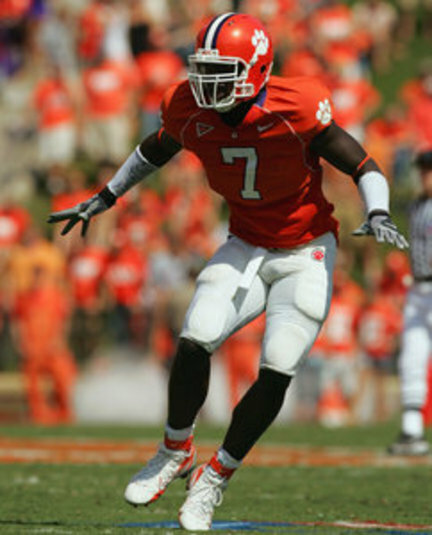 Sapp (6-4, 252) played his collegiate ball at Clemson and was a fifth-round selection in the 2010 NFL Draft. At Clemson, Sapp started in 36 games [played in 50] and recorded 142 tackles, 17.5 sacks and two forced fumbles. During his senior season, Sapp earned second-team All-ACC honors as he played in all 14 games and registered five sacks. However, his most impressive honor was finishing 15th on the school's all-time list with a whopping 38 tackles for a loss. Still, one of the reasons that Sapp fell in the draft is because he tore his ACL at the end of his junior season. Many teams worry that he might not have the same explosiveness he had before the injury. Before his costly injury, he was a lock to be a first rounder and even after he was projected as a top 50 player. Yet he slid all the way to the Eagles in the fifth-round. Nevertheless, Sapp fits perfectly into the Eagles defense. In college, he played the "bandit" position, which is very similar to the Eagles "joker" position [ stand up defensive end that can rush the passer or drop back in coverage]. Additionally, with the giant chip on Sapp's shoulder, he could be one of the biggest steals of this draft. He has the athleticism and pass rushing abilities to make an impact in his rookie season. Moreover, a full two years removed from the ACL tear is when players fully recover and return to form. Now that Sapp has signing his rookie contract, this makes him the sixth rookie that the Eagles have gotten under contract - Sapp, running back Charles Scott, linebacker Jamar Chaney, safety Kurt Coleman, defensive tackle Jeff Owens and cornerback Trevard Lindley. It is a good thing to already have six in the fold considering the Eagles have a league-high 13 picks to sign. Wide Receiver Jeremy Maclin was back on the practice field for the team's OTA on Wednesday. Yesterday, he was out with a "tight" hamstring. With DeSean Jackson not at practice, this gives Kevin Kolb the ability to gets some reps in with at least one of his starting wide receivers.